Safe space zones for free speech are about to become a thing of the past for Colorado college campuses. Just as soon as the legislature works out a few details, the bill will sail to Gov. Hickenlooper’s desk for his signature. Free speech is a wonderful thing — if we do say so ourselves — and college kids need to learn that it can be used anywhere, at any time in grownup land. 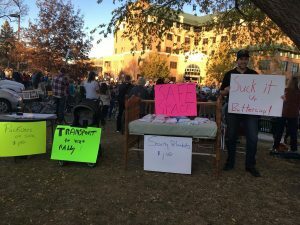 “College campuses are cradling students from different opinions that they don’t agree with and we’re really not preparing students for the real world,” said Juan Caro, a Colorado State University student and a member of the libertarian group, Young Americans for Liberty. The University of Colorado initially opposed the bill, but ended up changing their minds saying that it enabled them to maintain student safety. Protecting students is important, so long as it’s not handled like this.